An indicator released by the World Trade Organisation (WTO) to gauge global trade for January-March, 2019, has hit a nine-year low. Analysts say if global trade slows down, exports from India may face repercussions. The WTO’s quarterly outlook indicator, comprising seven trade parameters, stood at 96.3, the lowest since March 2010 and down from 98.6 in November. A reading below 100 means below-trend growth in trade. “The most recent WTO reading of 96.3 is the weakest since March 2010 and below the baseline value of 100 for the index, signalling below-trend trade expansion into the first quarter (of 2019),” the WTO said. The WTO forecast last September that global trade growth would slow to 3.7 per cent in 2019 from an estimated 3.9 per cent in 2018, but there could be a steeper slowdown or a rebound, depending on policy steps, it said. “This sustained loss of momentum highlights the urgency of reducing trade tensions, which together with continued political risks and financial volatility, could foreshadow a broader economic downturn,” the WTO said in a statement. The quarterly indicator is based on merchandise trade volume in the previous quarter, export orders, international air freight, container port throughput, car production and sales, electronic components and agricultural raw materials. “Indices for export orders (95.3), international air freight (96.8), automobile production and sales (92.5), electronic components (88.7) and agricultural raw materials (94.3) have shown the strongest deviations from trend, approaching or surpassing previous lows since the financial crisis,” the WTO said. 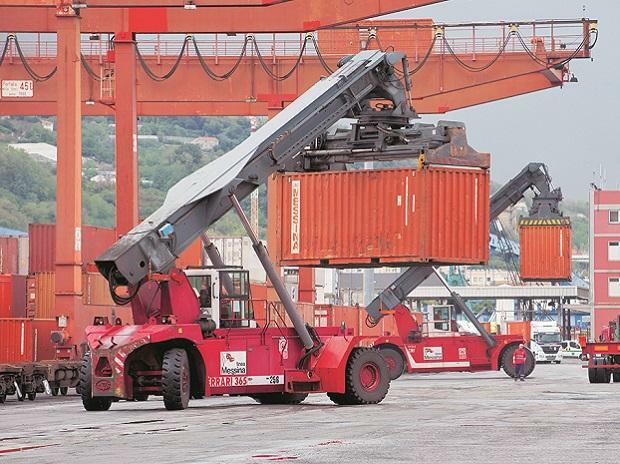 The index for container port throughput remained relatively buoyant at 100.3, but that may have been influenced by a front-loading of shipments before an anticipated hike in US-China tariffs, the WTO said. The WTO also said greater certainty and improvement in the policy environment could bring about a swift rebound in trade growth. In this connection, a meeting between the US and China is scheduled to be held on Tuesday in Washington to address tariff war will play a key role. Devendra Pant, chief economist at India Ratings, said exports from India would be hit if there is a slowdown in world trade. Though India is largely dependent on domestic markets, it requires additional support from the external sector to grow the economy higher than 7.5 per cent, he said. 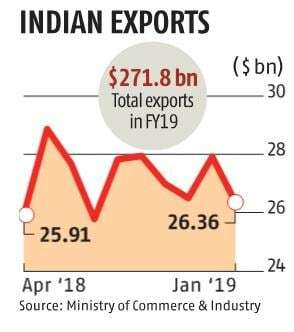 Exports from India rose barely 3.74 per cent in January. That it was at a three-month high showed that export growth has been muted in these three months. Exports rose just 0.8 per cent in November and 0.3 per cent in December. Though there was no official target, government officials were hopeful of hitting the $350-billion mark this financial year. That looks impossible now, but crossing last year’s figure of $303.5 billion does not.